The Lower Modernisms – 038. Lomo Featured Project: Dinah’s Family Restaurant, Westchester. Concluding the 2011 Googie Coffee Shops Bicycle Ride Series with the “Zombie Googie” ride. Endangered Lomo. 038. Lomo Featured Project: Dinah’s Family Restaurant, Westchester. Concluding the 2011 Googie Coffee Shops Bicycle Ride Series with the “Zombie Googie” ride. Endangered Lomo. January 8, 2012 by James Black. After exhausting over the course of the year the better part of Los Angeles County’s Googie coffee shops still in operation, the 2011 Googie Coffee Shops Bicycle Ride Series came to its logical conclusion on December 17th with the “Zombie Googie” ride, a tour of the extant remains of Googie coffee shops no longer in operation as such. Onetime monuments of a future-oriented present, the traces of these undead Googie coffee shops persist through varying states of decay and adaptive re-use, tugging at one’s nostalgia for both the past and the future simultaneously. Drained of Googie life force, we find that their corpses have been reanimated as blood-sucking, brain-eating banks and Starbuckses. Will some mad scientist succeed at finding the antidote for their Googie Zombie-ism? The development of a wider, authenticity-craving, Japan-like hipster consumer market is their only hope. 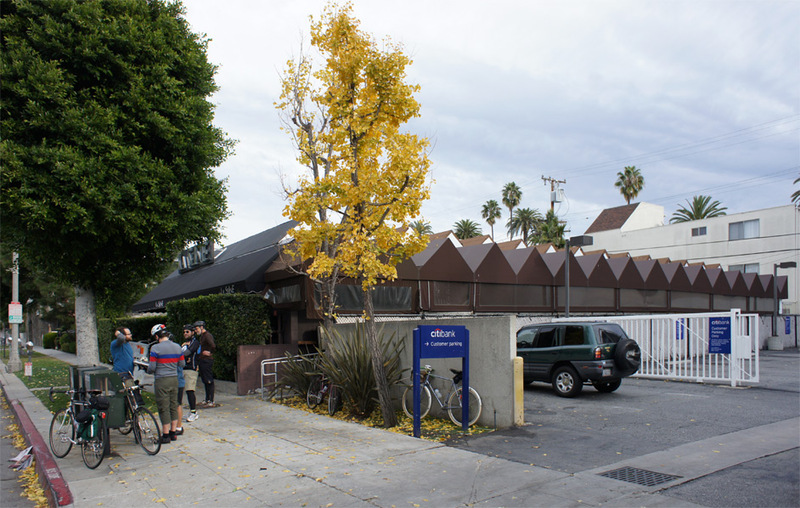 The tour’s first stop was the former Holiday Bowl Coffee Shop (1957, Armét and Davis). 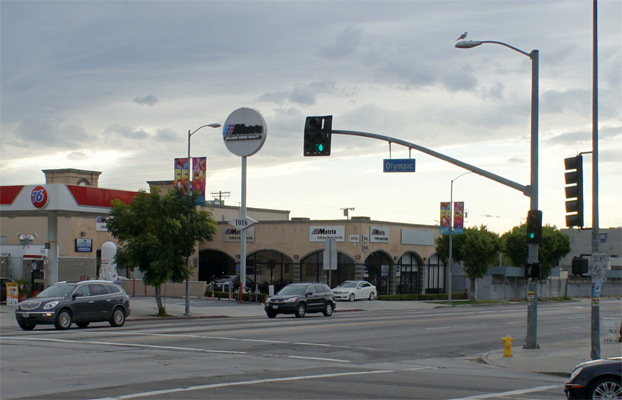 The Holiday Bowl was a culturally important community center for the Crenshaw neighborhood. After a preservation/redevelopment battle with losses on both sides, the coffee shop, the most visible component of the former bowling alley complex, still stands; the rest of the parcel has been redeveloped with ordinary strip center commercial buildings. Now operating as a Starbucks, the jagged architecture is still looking sharp. The roof is an inverted sawtooth, floating lightly above the storefront windows and decorated with contrasting wood trim that divides the plaster soffit into panels. 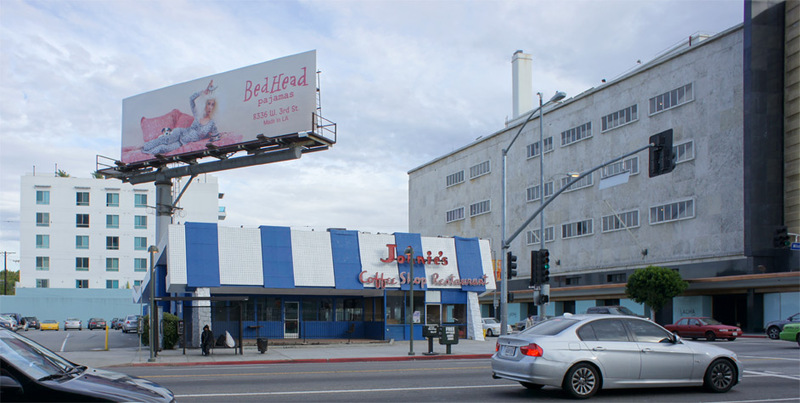 Our next stop was the former Romeo’s Times Square, aka Johnie’s, at the prominent corner of Wilshire and Fairfax (1955, Armét and Davis). A great example of Armét and Davis’s use of the folded-plate roof and located on a prominent, spacious lot, this building taunts us with the possibility of resuscitation – if any of these zombies has hope of returning to life as a coffee shop, it is this one. Romeo’s/Johnie’s was in the news lately, owing to its endangered status. 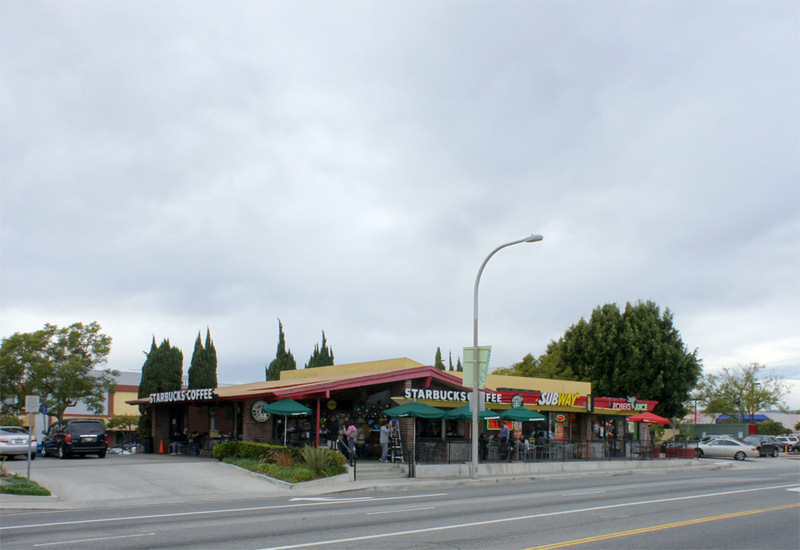 It has been owned for years by the 99¢ Only empire, which operates a store on an adjacent lot and uses Johnie’s parcel for overflow parking, with the coffee shop itself primarily used as an occasional filming location. 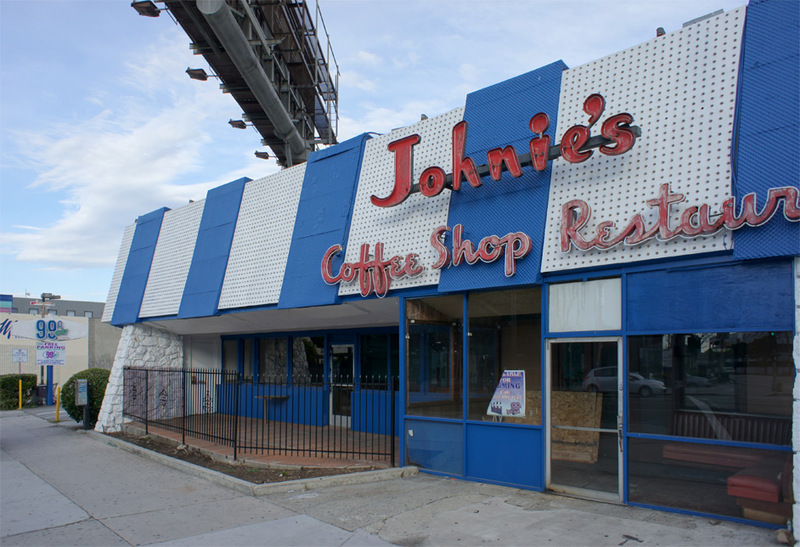 With 99¢ Only to be taken over by a private equity firm, the future of Johnie’s is uncertain, as a dilapidated coffee shop is a far cry from the developer’s definition of the Highest and Best Use of such a high-profile parcel. Despite my fantasy of going to a cleaned-up Johnie’s for pancakes some bright future morning, my favorite idea is that suggested by commenter “reverto” on the afore-linked New York Times blog entry, who proposed that Johnie’s shell be preserved by transforming it into the entry to a future subway station at this corner. Next stop, the former home of Tiny Naylor’s on “Restaurant Row” on La Cienega in Beverly Hills (1957, Armét and Davis again), now home to a fancy restaurant called “La Seine.” To see the place today you would never guess its Googie origins, but the zig-zag profile of the canvas awning reflects the zig-zagging soffit inherited from Armét and Davis’s original design. 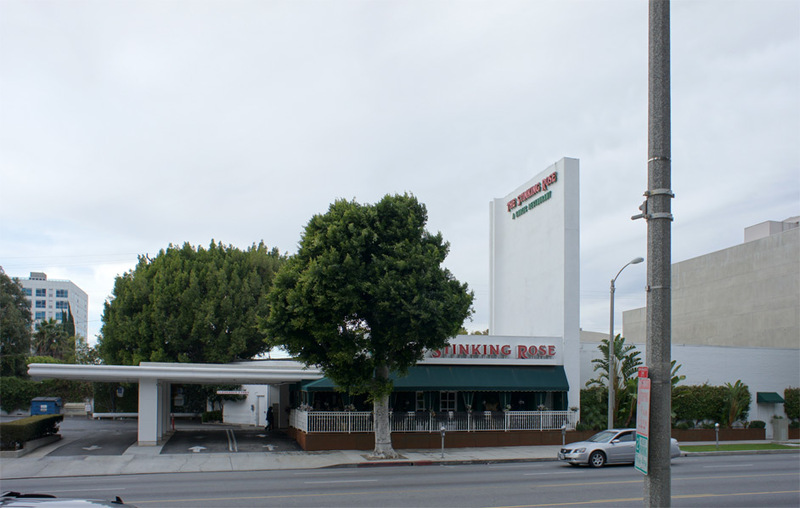 Across La Cienega lies the Stinking Rose, former home of Lawry’s Prime Rib (1946, Wayne McAllister). Compare the original appearance – traces of McAllister’s Lawry’s can still be seen in the Stinking Rose’s form, but the stony pilasters and buttresses have been whitewashed and smoothed over. The Stinking Rose’s exterior now looks like a bland postmodern hybrid of neo-Streamline and neo-Regency. 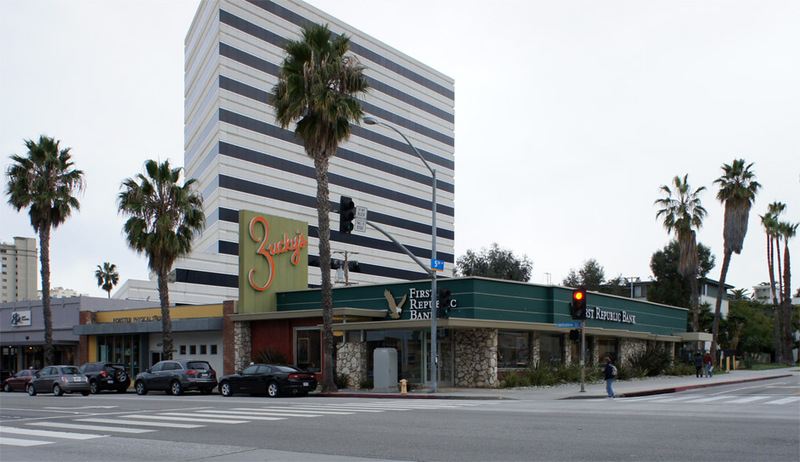 A few blocks south at Olympic Boulevard lies the former site of Ships La Cienega (either 1967, Armét and Davis or 1963, Martin Stern, Jr. – I have come across citations for both, but it hardly matters until we find some decent photos of the restaurant itself). Ships’ space-age sign, lonely and stoic, persisted long after the restaurant was gone. Now the circle- and diamond-shaped signs for Matrix Collision Repair, itself a rather less distinguished work of architecture, are the only index of what was. The well preserved exterior of the former Penguin Coffee Shop in Santa Monica (1959, Armét and Davis) now shelters a dentist’s office, the penguin on top of its sign now rendered a non sequitur. The Santa Monica Public Library hosts several good photographs of the coffee shop that it used to be. Its site overlooking the sunken Santa Monica Freeway seems like a disadvantaged and traffic-besotted location today, but 50 year ago this must have been an exciting spot for a modern coffee shop. On Wilshire, the former Zucky’s restaurant has been converted to a First Republic Bank (1954, sign, 1962, Weldon Fulton). Curiously, it is the sign, rather than the building, that has been granted historical monument status by the city of Santa Monica, which is the presumptive reason why the bank is still flying the Zucky’s flag. On the way through town we detoured past a couple of homes designed by the firm of John Friedman Alice Kimm Architects on which Googie rider Garrett Belmont worked. 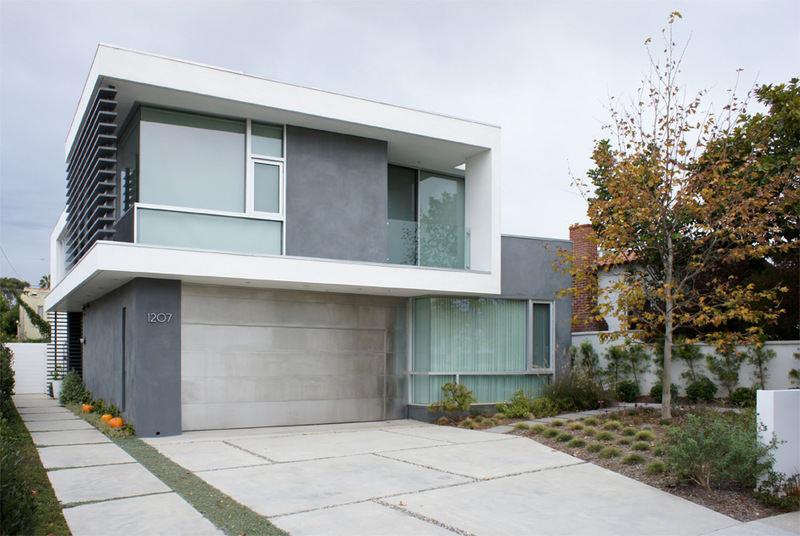 These homes were an appropriate detour within the context of today’s ride, insomuch as both homes explored a folded-plate design language. 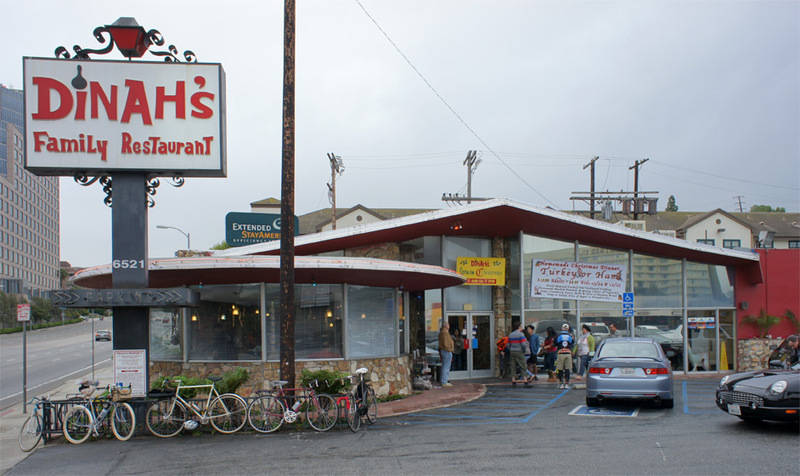 The next stop for the hungry riders was Dinah’s Family Restaurant (http://dinahsfamilyrestaurant.net/), a late-Googie coffee shop on Sepulveda Boulevard in Westchester (architect unknown). The exterior massing at Dinah’s front, all finished in glass and Flintstones rock, collides a flying saucer with a gabled roof. The interior is idiosyncratic. Colorful saucers sprout like upside-down mushrooms from the ceiling. 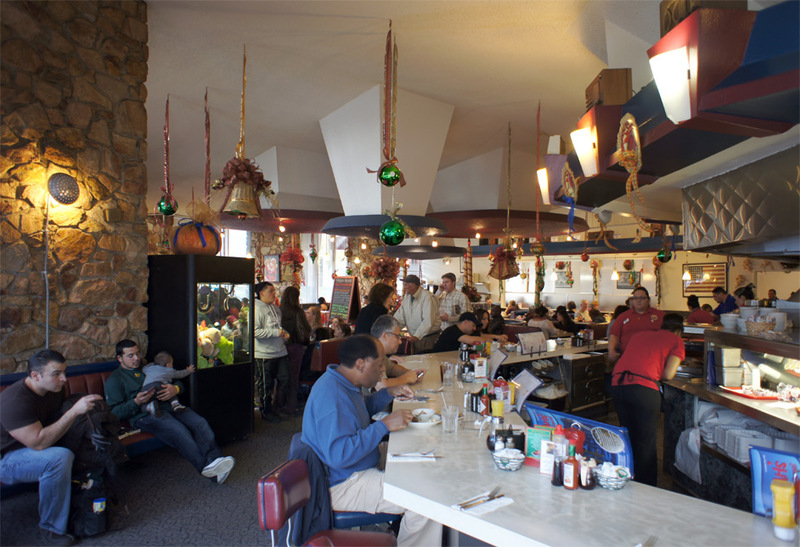 Dinah’s is a big, bustling place, with a vitality rarely seen in the Googie coffee shops that we visited this year. 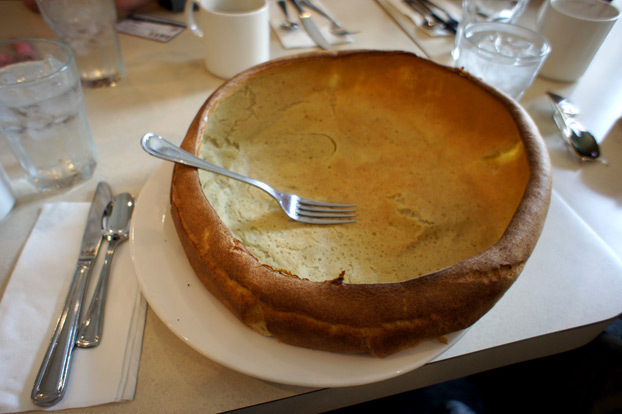 Dinah’s is also one of the few places in town where you can order an enormous “Dutch Baby,” here called the baked German Pancake. The fork in the photo only looks like a miniature fork – it is an illusion! The last stop of the day was the former Ships Culver City on Overland Avenue at Washington Boulevard (1957, Martin Stern, Jr.). The casual visitor would barely notice its Googie heritage; but other than the chopping down of the famous Ships sign, the exterior has not been modified much, as you can see in comparison to this photo of Ships from the mid-1980s. Now, sadly, Ships is home to a Starbucks, a Subway and a Robeks. 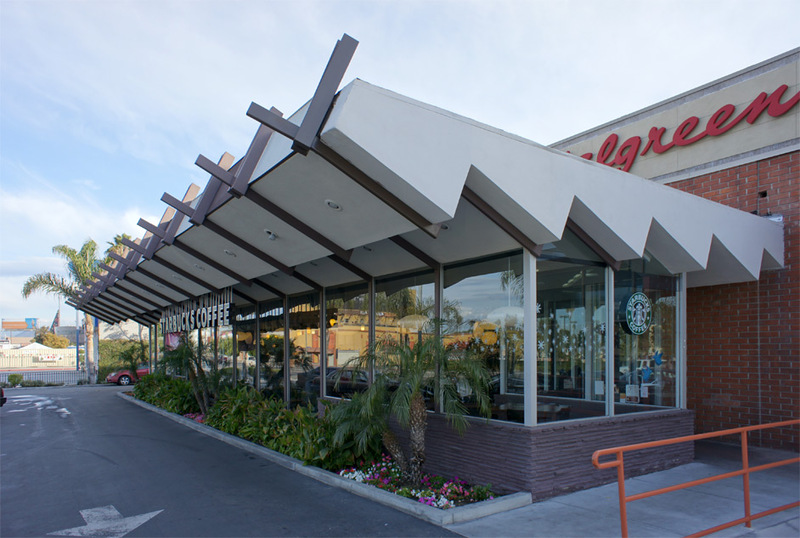 We have visited two Starbuckses today, and therefore must acknowledge that Starbucks has become, weirdly, one of the great custodians of Los Angeles’s Googie heritage. Ride participants Bob Beresh and Rick Risemberg, both accomplished photographers, have published their photos from the December ride. Here are a few words in reflecting on this year of bicycle rides in which we visited the best of the few remaining Googie coffee shops in town. 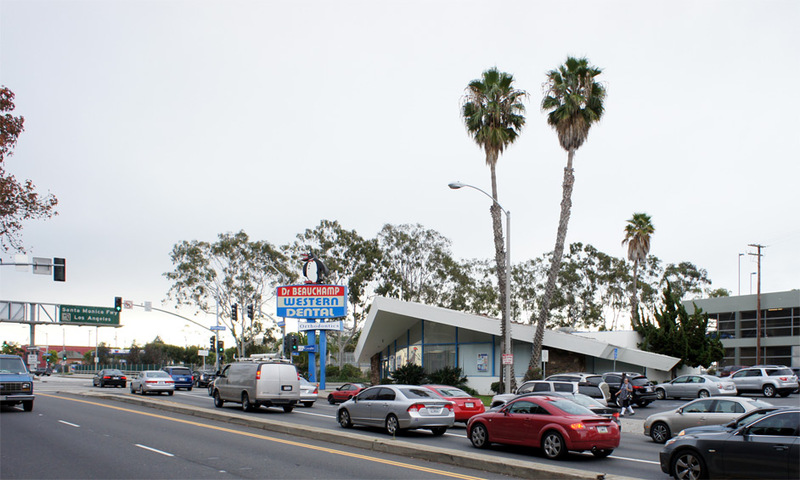 There was value in observing so much Googie architecture deliberately, as it highlighted both the common characteristics and the differences between projects and architects. It was bracing to see the present-day state of this endangered typology – go see them now, for the long-term prognosis is bleak. The ride series also offered the same intrinsic benefits as any deliberate project of this sort – forced to carry out rides on a predetermined schedule, we therefore did go on regular bike rides to different parts of town, saw much of the city, and ate pancakes. 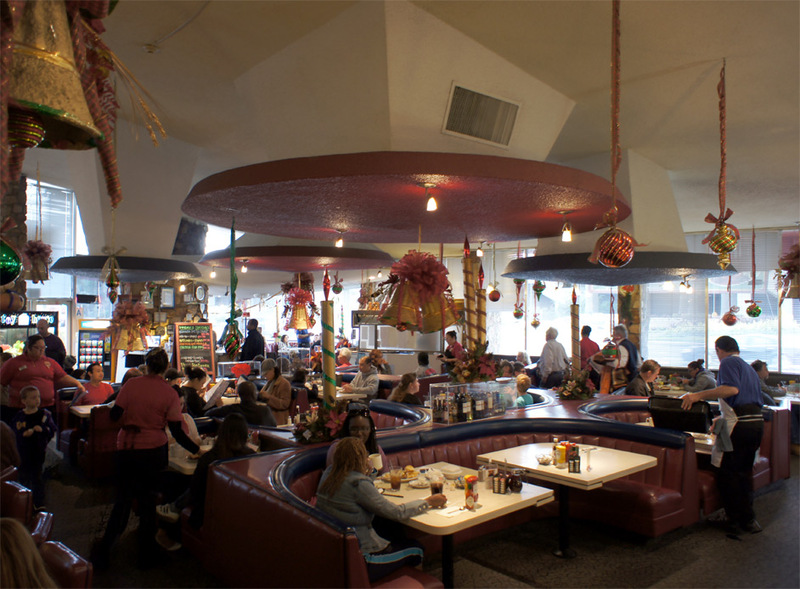 I will remember 2011 as the year in which we saw the Googie coffee shops. I wish a Happy New Year to blog readers. I intend to continue regular work on the Lower Modernisms project through 2012, for I still feel as though I am just getting started. With the bike ride series complete, there will be fewer compulsory posts on the subject of Googie coffee shops (which, as I argued back in post 005, are now “nearly too legitimate a form of Modernism to be considered within the intended scope of the Lower Modernisms project”). I am looking forward to more “Lomo Manifesto” posts, and more documentation of featured projects that are genuinely Low. Please join me in my LoMos odyssey.